It happens every season, and least it seems like it does. Most of us, myself included, go through the song and dance of overstating the league’s balance every October. In some ways we are awarded with our “bold” proclamations – Fairleigh Dickinson won the 2016 NEC tournament after a ninth place selection in the Coaches Preseason Poll. 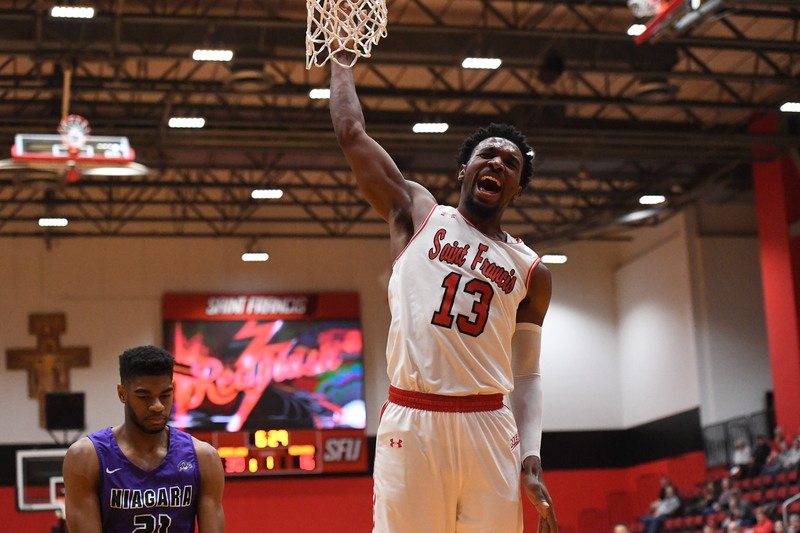 Saint Francis University followed their ninth place designation a preseason later by getting to the NEC Tournament final on a team loaded with talented underclassmen. But that’s not what I really mean by parity. Sure, teams exceed or underachieve their expectations every year, but what we truly mean by parity is that the league top to bottom will be competitive. And most of the time, the NEC standings usually shake out by early February and we become clearly aware of who the contenders are. This season, on the other hand, feels legitimately different. Hey guys, Saint Francis is tied for 1st, just as we all predicted in Oct! Our friend at The Blue Devils Den (seriously, follow him @BlueDevlsDen) highlights the weirdest of the league, especially after this past weekend. After reading his post, I was willing to take a cursory look into the recent past to determine how unprecedented the current Northeast Conference standings layout is. I had a hunch that 9 teams being within 3 games of each other was atypical. As I suspected, the current season has an unusual amount of parity and balance any way you slice it. There are five teams either in first place or within 2 games of the top spot. The difference between fifth place and ninth place is merely a game. Over the past 6 seasons, the top nine programs have never been as close as they are today. 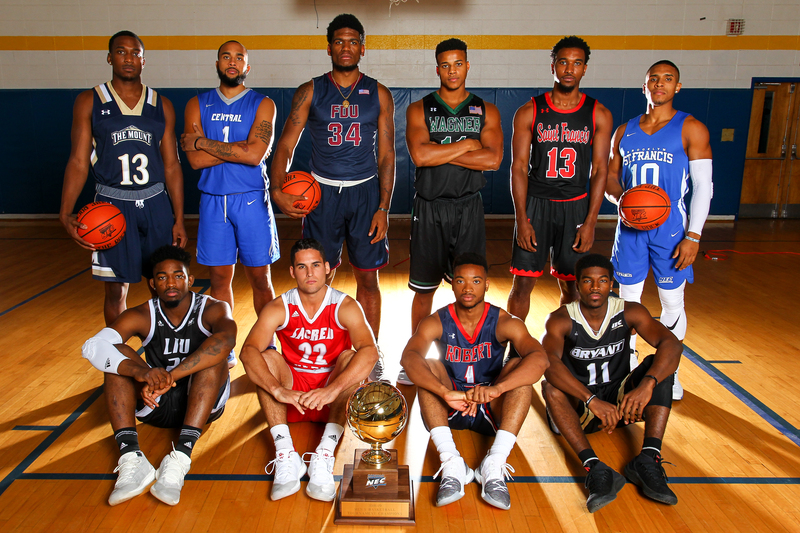 We saw a similar amount of parity in 2015-16, the aforementioned campaign where the Knights stunned the world with a roster headlined by sophomores Darian Anderson, Earl Potts, Marcquise Townes and freshman Mike Holloway. Nevertheless that season of parity clearly had a demonstrated top 8, whereas nine teams this season all have a chance at securing a top 4 spot in the NEC tournament with only six games remaining. 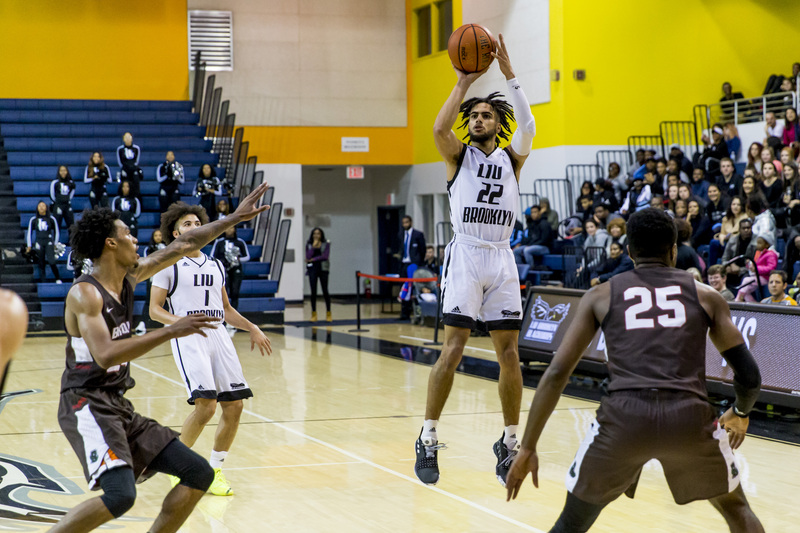 It’s certainly more of a long-shot for those programs – LIU Brooklyn, Bryant and CCSU – that sit with a 5-7 record, but a 5-1 stretch or better could theoretically get them a home playoff game. Are you willing to bet against Tyler Kohl, the defending champs in LIU or a feisty bunch in Smithfield, Rhode Island? 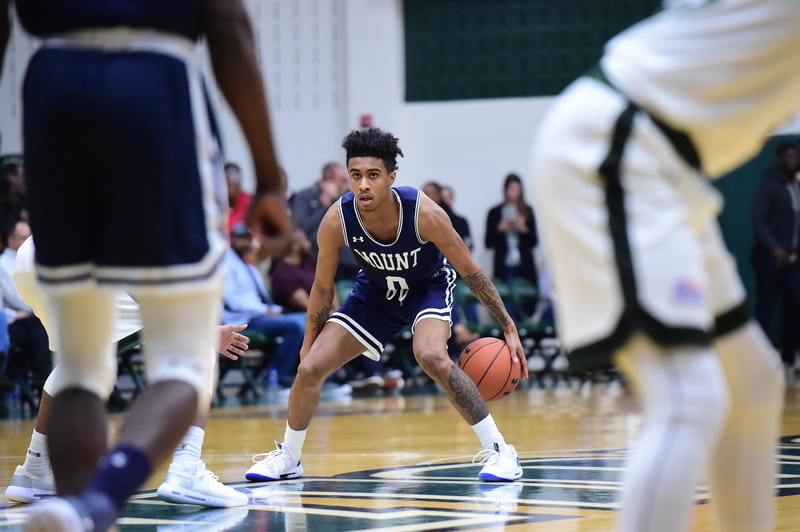 Even the Mount at 3-9 has a chance to make the NEC tournament, with road showdowns against Central Connecticut and Bryant coming up. All of the last place teams from the previous five seasons didn’t have a reasonable shot to make the NEC tournament. You can’t say the same about Dan Engelstad’s energetic and dangerous roster. How will the 2018-19 season shake out? It’ll be a fascinating final stretch of the season, with each game offering the potential of dramatic shifts in seeding. Tiebreakers will loom large. Enjoy the action – it certainly won’t be dull as we approach March. Defensive wins championships. Or something like that. 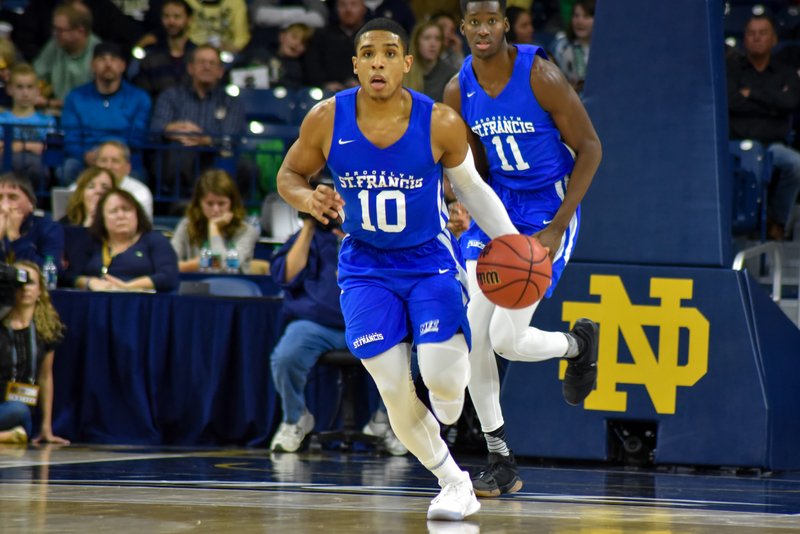 While there isn’t one avenue to winning the NEC championship and punching your ticket to the NCAA tournament, playing exceptional defense will certainly improve your chances. There have been countless examples over the past decade of teams finishing in the top half of the league, thanks in large part to a tenacious defensive effort. One third of the way into league play, Robert Morris and Sacred Heart stand tall as the two best defensive squads, at least in terms of KenPom’s defensive efficiency. I find it interesting that both programs are going about their defensive excellence in different ways. With their much anticipated match-up on the horizon this Thursday, allow me to examine what has made each program difficult to score on during the six-game sample size. On a team that’s fairly inexperienced going into the season, depth and balance weren’t expected to emerge as strengths for Anthony Latina’s squad. Instead, the new look roster that routinely features three freshmen and one sophomore improbably leads the league in scoring (81.1 ppg), assists (15.2 apg) and is second in field goal percentage (46.4%) and rebounding margin (+5.1 rpg). If you factor tempo into the equation, as any good statistician would, Sacred Heart has the best raw offensive efficiency after scoring 105.5 points per 100 possessions through 18 Division I games. While the Pioneers offense has gotten a lot of attention this season, it’s actually their defense that’s been noteworthy of late. Through six NEC games, the Pioneers find themselves 2nd among their league counterparts in defensive efficiency at 93.2 points allowed per 100 possessions. In four home victories, the Pioneers haven’t let an opponent score over a point per possession and have been relentless in their defensive ball pressure. Case in point: road opponents are shooting just 16.9% on their 3s and they’re shooting less of them (37.4% 3PTA/FGA) compared to the league average. One focus of Anthony Latina and his coaching staff has been to restrict 3-point attempts – remember the discussion we had regarding St. Francis Brooklyn? – by focusing on the team’s defensive tenacity in practice. The blueprint: Stay in front of your defender, challenge the shot and mix up your defensive schemes to cause discomfort. Because of the Pioneers’ focus on staying in front, they’re taking less chances in turning opponents over (aka less risk and less fouling), as evident from their league worst 16% turnover rate. Thus far the formula has worked well, especially after holding CCSU, Bryant and Wagner to 61, 70 and 38 points, respectively. Just from purely a shot blockers standpoint, Spellman’s effort has been historic. Not only is he on the floor more often than the other four defensive standouts in their peak seasons above, but he’s also done a decent job staying out of foul trouble, unlike a couple on the list. He’s committed a modest 4.5 fouls per 40 minutes, which is a respectable number given the 6-foot-10 center’s activity around the rim. There’s no doubt his presence is a major reason why teams are converting just 45.5% of their 2-point takes against Sacred Heart. It’s also worth noting that the Pioneers have done well to eliminate their opponent’s second chance opportunities, which is where the team’s positive rebounding margin comes into play. With Spellman (21.4% defensive rebounding rate) and EJ Anosike (18.4%) leading the charge, as well as some guards who aren’t afraid to attack the defensive glass in traffic (Koreem Ozier, 16.4%; Cam Parker, 13.1%; Zach Radz, 11.7%), there’s another reason why the opponent’s field goal percentage inside the arc has been depressed. Putbacks are high percentage opportunities to score and this current roster has limited the damage their opponents can do with respect to that. Wet blanket alert: there is some room for regression in the Pioneers’ defensive efficiency numbers, unless you truly believe Sacred Heart will hold league opponents to just 26.6% shooting from behind the arc all season (spoiler alert: I don’t). But even as these percentages progress more toward the mean, the overall metrics still portray a defensive unit that’s on the rise thanks to their perimeter tenacity, grittiness and their defensive play down low. Now the true test is upon them: can Latina’s group continue this effort away from the friendly confines of the Pitt Center? 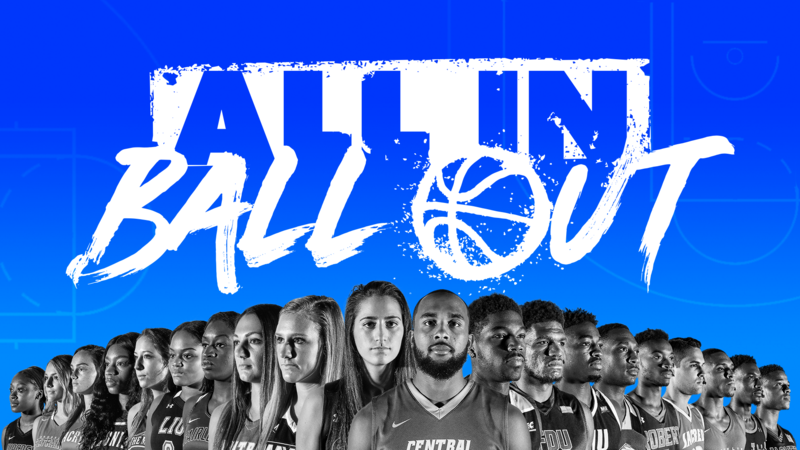 Their 1-6 road record against mid-major opponents this season is glaring and must be improved if this team intends to compete for the NEC championship. We should learn a lot with trips to Robert Morris, Saint Francis and Mount St. Mary’s in their next three. The Pioneers are 3-13 at these venues over the last half decade. Death. Taxes. Andy Toole coaching elite defense. The nine-year Robert Morris coach is a master at stopping opponents from scoring and this season is no different. Their current trend of allowing just 92.5 points per 100 possessions in league play would be the best mark a NEC program has achieved since the 2011-12 Wagner Seahawks, coached by Dan Hurley, permitted just 90.1 points per 100 possessions. Can the Colonials realistically keep up their current pace? Based on Toole’s history of repeatedly finishing in the league’s top three defenses year after year, I believe so. And this year it’s partly because of one critical senior. I’m in awe of Malik Petteway. Allow me to explain with some tweets. It’s insane what Malik Petteway is doing for @RMUMBasketball in league play on defense. It’s very Chris Wray like: in 6 #NECMBB games Petteway has compiled 30 def rebounds, 16 steals & 10 blocks while averaging 21.5 mpg. His anticipation to disrupt is really second to none. While I don’t have copious amounts of time to determine if these numbers are unprecedented, they are incredible to look at on paper. Petteway is among the NCAA individual leaders in block rate (8.2%, 61st nationally) and steal rate (4.5%, 22nd nationally), while grabbing 23.0% of the opponent’s misses. His athleticism, defensive anticipation and hustle have turned him into the next Chris Wray of the NEC. We all became aware of Petteway’s defensive prowess in Robert Morris’ first conference game of the year. Among this highlight reel of plays, I was most impressed with Petteway’s ability to step up when Robert Morris needed him too. In the above clip at the 0:22 second mark, Petteway aggressively hedged on a high pick and roll, stole the ball from the very reliable Adam Grant (13.1% turnover rate) and dunked it home in the open floor. The highlight play halted a 10-2 Bulldog run and essentially stopped the Bulldogs in the midst of their furious comeback attempt. 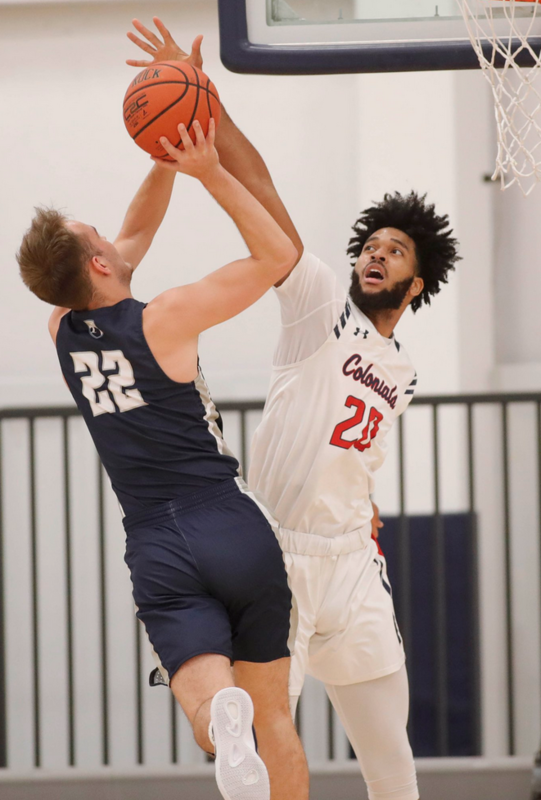 And if that wasn’t enough, Petteway threw in an emphatic block (0:38 in the clip) on the very next possession to stick the nail in the coffin and deliver the Colonials yet another road victory. In the team’s televised road game against the 4-2 Terriers, Petteway logged a couple of thefts in a critical part of the game on back-to-back possessions. 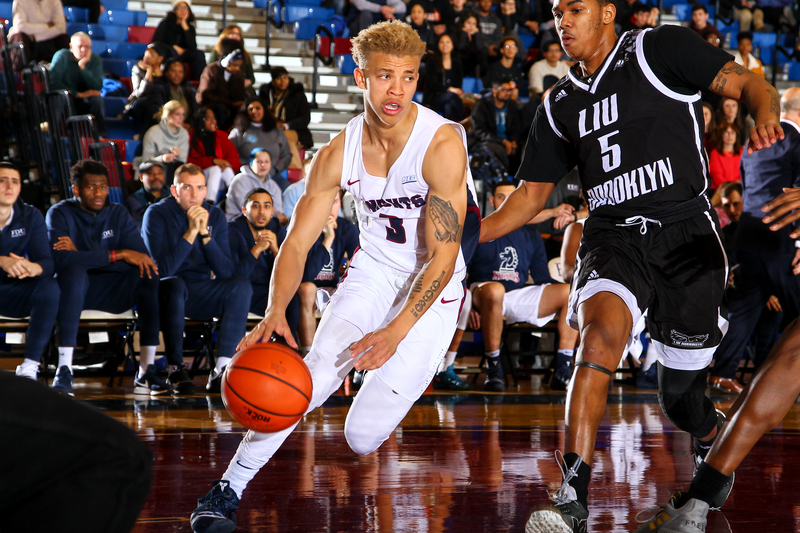 The two takeaways, around the 4-5 minute mark of the second half in a tight contest, led to four Robert Morris points, which can’t be understated in an offensive slog of a contest decided by just three points. Again, Petteway did it with his anticipation and exceptional defensive awareness. It’s clear Petteway has added another dimension to the Colonials defense. His ability to generate turnovers along with backcourt teammates Matty McConnell (3.5% steal rate) and Jon Williams (2.5% steal rate) gives Toole a trio that has taken the rock away on 23.5% of their opponent’s possessions, good for 16th in the country. The turnovers have given the Colonials more opportunities in transition, where they’ve been more efficient shooting the basketball. According to Hoop-Math, Robert Morris has posted an effective field goal percentage (eFG) of 60.0% in their transition opportunities. For a team that averages 48.1% eFG overall, that’s a massive boost to the Colonials offense. 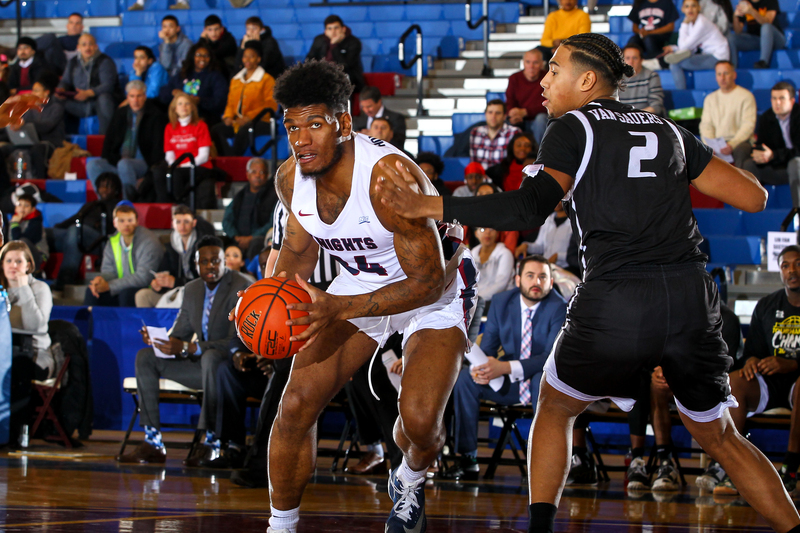 Three of Robert Morris’ next four games feature potent offenses in Sacred Heart, Fairleigh Dickinson and Saint Francis U. Will the Colonials continue to impose their will and turn these contests in half-court affairs focused on execution, or will high tempo win out? We will learn a lot about these two defenses in the coming weeks. Enjoy the upcoming action! For some players, the glory lies in being part of the starting five. You’re introduced to the crowd. You’re on the floor for the opening tip. You’re part of the group that sets the energy/tempo of the game. You simply can’t beat that adrenaline rush. But for others, when they are inserted into the game isn’t critical; rather, they yearn to be part of the most critical moments. Because when a coach trusts you enough to play in the final five minutes of the game, that’s when the lights shine the brightest more often than not. In the Northeast Conference, there have been plenty of primetime performers (sorry to steal your term, Ron!) coming off the bench this season. I’d like to highlight my “starting five” of these outstanding sixth-men, as they’ve provided stability and spark to their respective second units in the early going. Let’s begin with one of the best two-way players in the NEC! 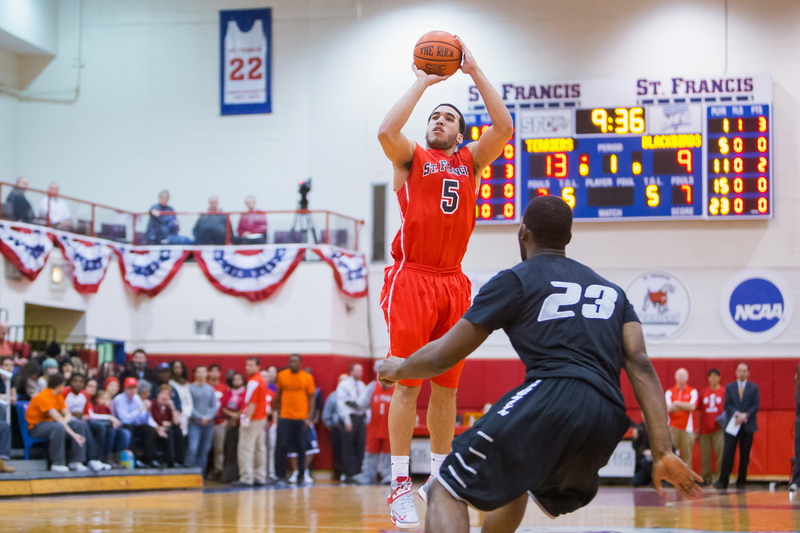 Isaiah Blackmon, Saint Francis U – Rob Krimmel has been careful easing Blackmon into action, and with good reason. The dynamic talent is a year removed from knee surgery, but you wouldn’t know that of late. In his last five games, four of which he came off the bench, Blackmon has averaged 15.2 ppg while shooting 56.3% from the field. Additionally, his elite athleticism appears to be back – he’s been a menace on the offensive glass by grabbing 9.2% of his team’s misses when he’s on the floor. 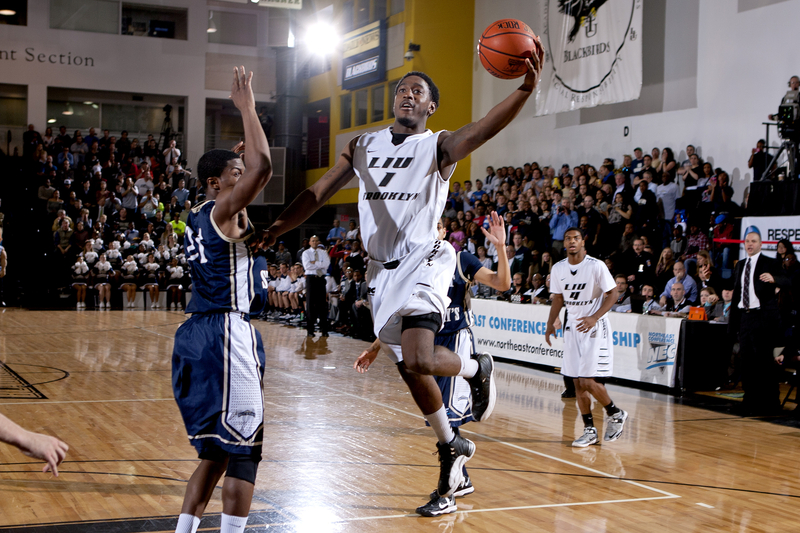 It’s fair to assume Blackmon is rounding into form as the NEC conference season rapidly approaches. 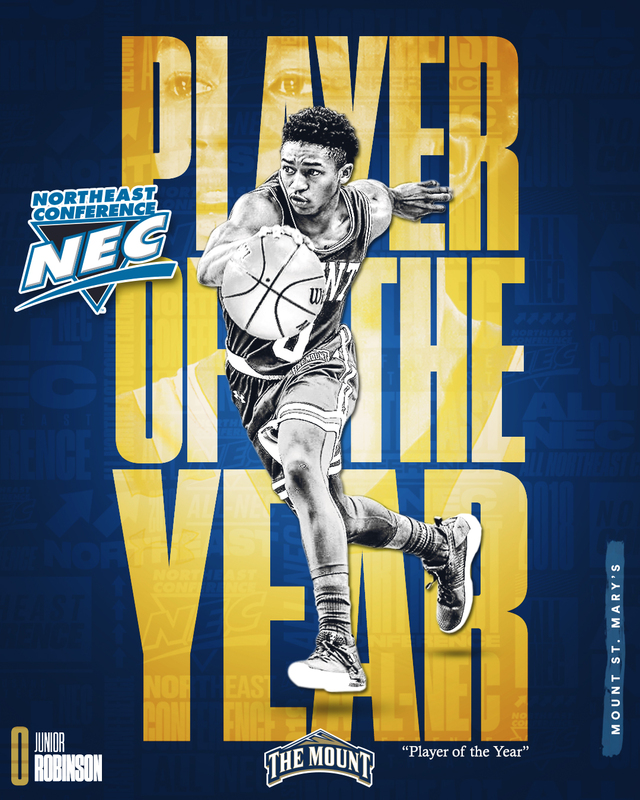 It speaks to the program’s depth that Blackmon, who’s started 30 times in his collegiate career and was part of the NEC’s preseason first team in 2017, can serve as an explosive six-man on a team rife with expectations. Joe Hugley, Central Connecticut – When looking at Hugley’s advanced numbers at first glance, it’s hard to believe the junior hasn’t even played in half of the Blue Devils available minutes. But that’s the role Donyell Marshall has tasked Hugley with, partly because Hugley reminds the head coach of himself in the latter half of his NBA career. And so far, Hugley has bought in, scoring in double digits in seven of his last eight games. He’s registered a block in six straight, while corralling at least six boards in 5 of 10 contents. In terms of efficiency, the Maryland native easily possesses the highest offensive rating (118.3) of any NEC player that has a possession rate north of 20%. Hugley’s scoring acumen and energy level clearly has been an asset off the bench, six weeks in. Kaleb Bishop, Fairleigh Dickinson – While the junior is still rounding into form with respect to his scoring, Bishop has registered career highs in offensive rebounding rate (11.8%), defensive rebounding rate (23.7%), and block rate (4.0%) as a junior. Off the bench, the 6-foot-8 forward has grabbed at least six rebounds in eight of tencontests. With the insertion of sophomore Elyjah Williams, Greg Herenda now can afford to make athletic Bishop part of his second unit to serve as the four or five. 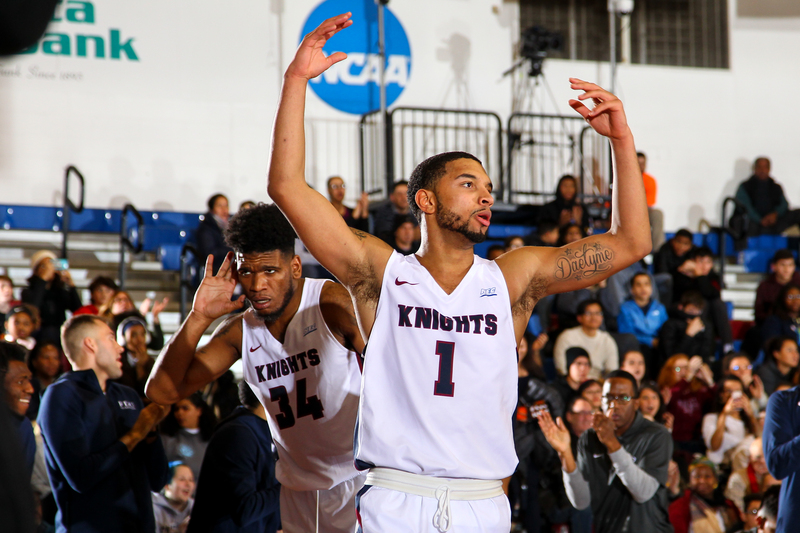 Malik Petteway, Robert Morris – With an injury riddled junior year behind him, Petteway has provided productive bench play similar in the way that Billy Giles did as a junior during the 2015-16 season. Of course, Petteway and Giles are different power forwards, but there are similarities in their ability to rebound, score efficiently around the rim and providing some rim-protecting capabilities. For Petteway, it’s his defensive acumen and physical presence that affords Robert Morris a proven bruiser down low. His block rate (5.3%, 3rd in the NEC) and defensive rebounding rate (19.5%, 9th in the NEC) are evidence of that. 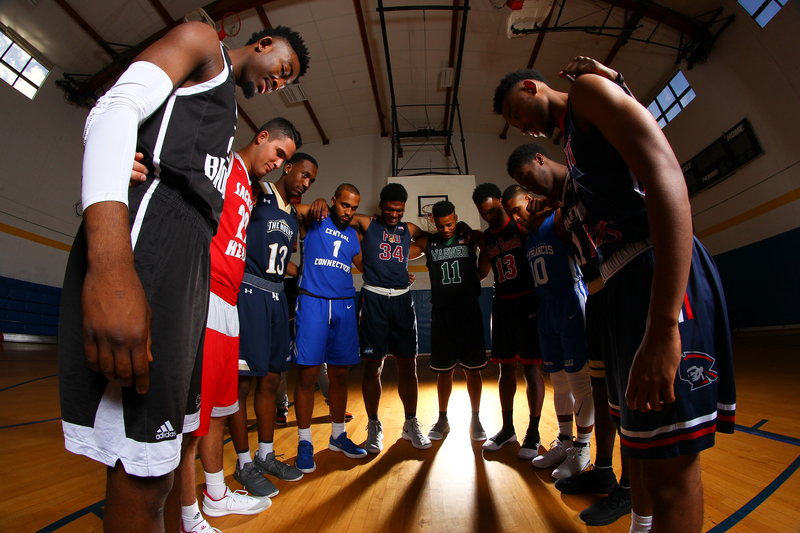 Chauncy Hawkins, St. Francis Brooklyn – Like many freshman, Hawkins needed time to adapt to the rigors and speed of Division I, but once he did, he was off and running. The freshman posted a respectable 98.0 offensive rating in league play last year, so a production boost in 2018-19 shouldn’t come as a surprise. 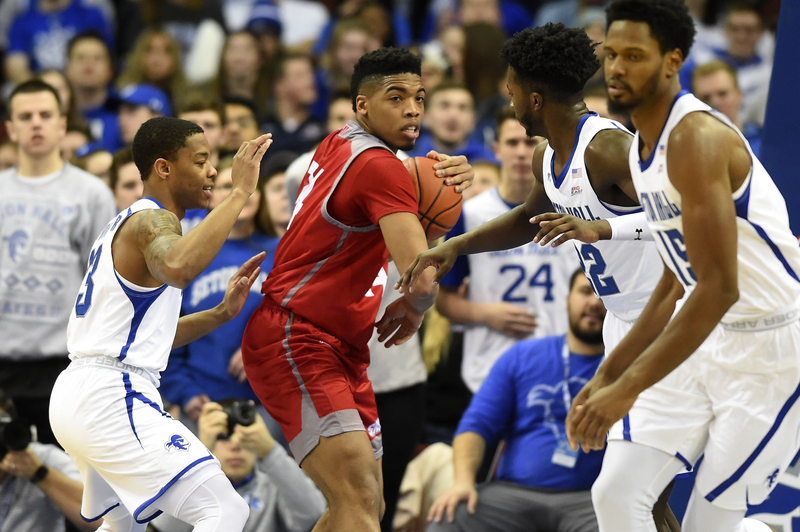 Hawkins has poured at least 16 points in six contests, four of those resulting in Terrier wins. 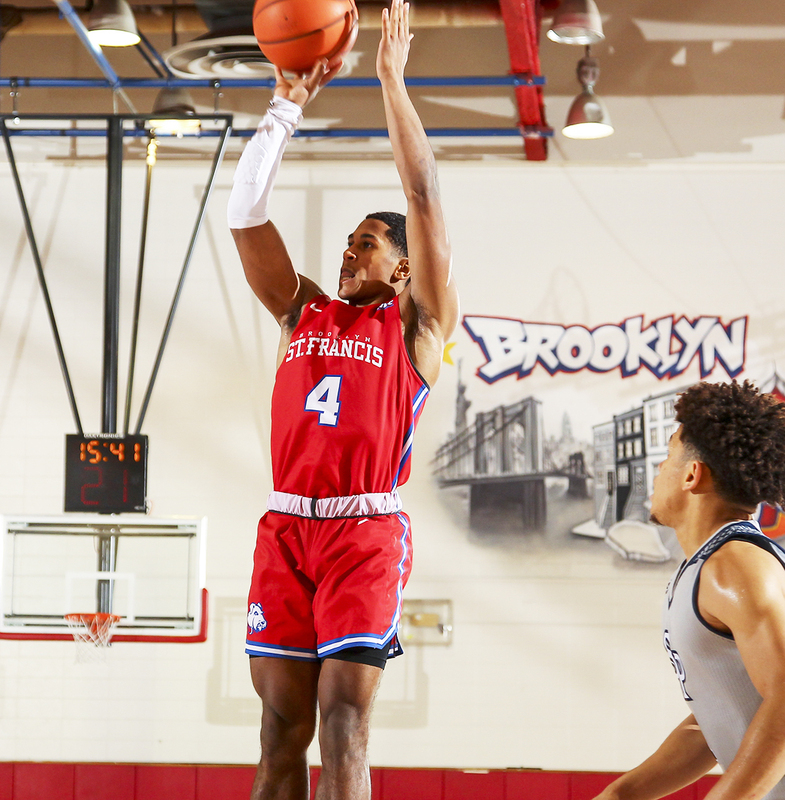 He may not be on the floor at the opening tip, yet Hawkins has provided St. Francis Brooklyn with the necessary pop and versatility off the bench. It’s safe to expect the trio of Hawkins, Glenn Sanabria and Jalen Jordan – the best offensive lineup St. Francis can boast according to Glenn Braica – will play together, especially late in the 2nd half. According to KenPom, that has already happened at least 26% of the time in the Terriers available minutes over the past five games. Speaking of Hawkins, I’ve been fascinated with one key tenet of St. Francis Brooklyn’s philosophy: restricting their opponent’s 3-point attempts. In the age of the 3-point shot and its increasing use, some programs are making a concerted effort to suppress the opponent’s attempts from behind the arc. The philosophy was a staple of Mount Mayhem under Christian – one of the key attributes is that you take a lot more 3s than your opponent. Makes sense, right? If you are going to lose, why not lose because your opponent made a high percentage of deep 2s, traditionally the least efficient shot in college basketball? Glenn Braica has excelled at this in recent years and he’s at it again with his 2018-19 Terriers. As Ken Pomeroy has demonstrated in the past, it’s much easier to limit a team’s 3-point attempts than to affect their accuracy from behind the arc. Braica’s teams have certainly done the former, finishing in the country’s top 20 over the past five seasons. Despite the Terriers tenacious defense along the perimeter, sometimes their opponents have made a high percentage of their 3-point attempts (see 2016-17 and 2014-15 as an example). But at the very least, it helps when those made 3s aren’t as frequent due to your defense’s suppression techniques. Is applying this philosophy merely a defensive mindset or does having length, particularly athletic length, and lateral quickness help as well? In all honesty, Braica doesn’t have an answer nor is he specifically instructing his players to suppress 3-point attempts. The suppression is merely an aftereffect of the Terriers razor sharp focus on defense in practice sessions. Play hard, apply ball pressure, fight through screens and deny passing lanes – all of those fundamentals lead to a tenacious defensive effort that, guess what, limits the number of 3-point attempts their opponent takes. It’s really not rocket science, nor does it require recruiting a certain type of athlete. It appears to be a coaching thing and the Terrier players have clearly bought in. Right now, a majority of the NEC programs haven’t shot the 3-ball well. While much of that is likely due to the elevated competition, St. Francis Brooklyn may have the upper hand come conference play in limiting their opponents 3-point production. It’ll be interesting to see how this shakes out starting in January!